have less to do tomorrow. After I post this card, I am going to get the table set up for our Thanksgiving feast. Can't wait to smell that giant bird cooking in the morning. I made four of these cards for my friends that are coming for lunch in December. I have a little gift bag and I have showed you the things I have made already. A white on white card. 5x7 base card. Gold Perfect Pearls mixed with water in a mini spritzer. Oh your card is gorgeous. I so love the white and then your beautiful poinsettia! Have a wonderful turkey dinner. This is stunning Sue, I love the poinsettia. The colours and textures are gorgeous. Oh Sue your card is stunning, so elegant, lovely embossing and the poinsettia is gorgeous, love the colouring and how it's decorated. This is just gorgeous, Sue. Your friend are going to love it as much as the little bags you made for them. I'm going to put my turkey in the oven now. I, too, love that smell when he starts to cook. Have the happiest of Thanksgivings my friend. This is beautiful, as is the card for your daughter! Sue, this is gorgeous! 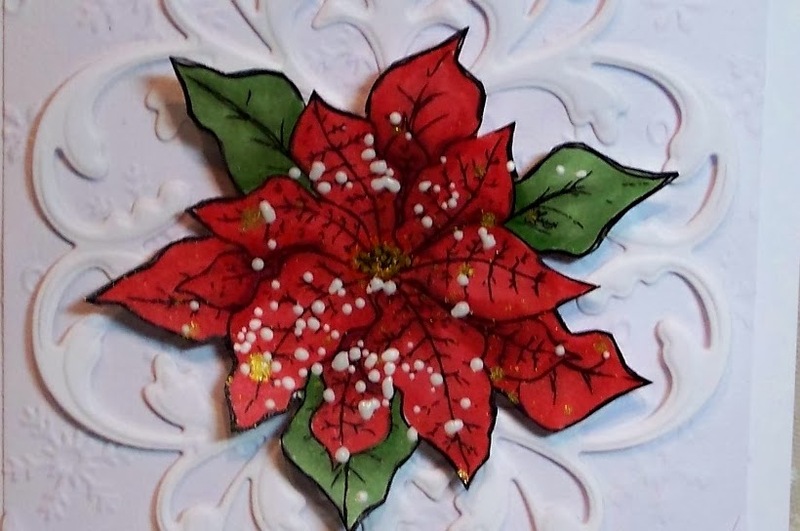 The poinsettia just pops off the white page! Have a wonderful Thanksgiving my friend! 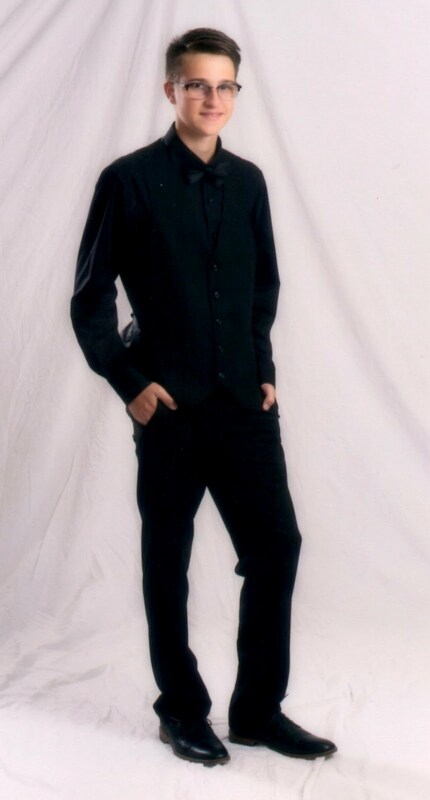 Sue this is just GORGEOUS!! 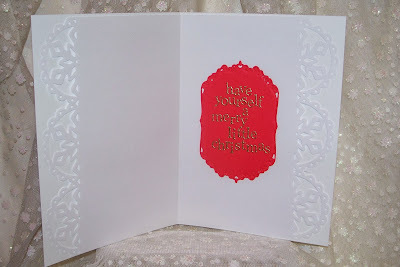 The white card just makes your beautiful poinsettia pop...your friends will LOVE their cards!!! Hi Sue,hope your Thanksgiving was wonderful! 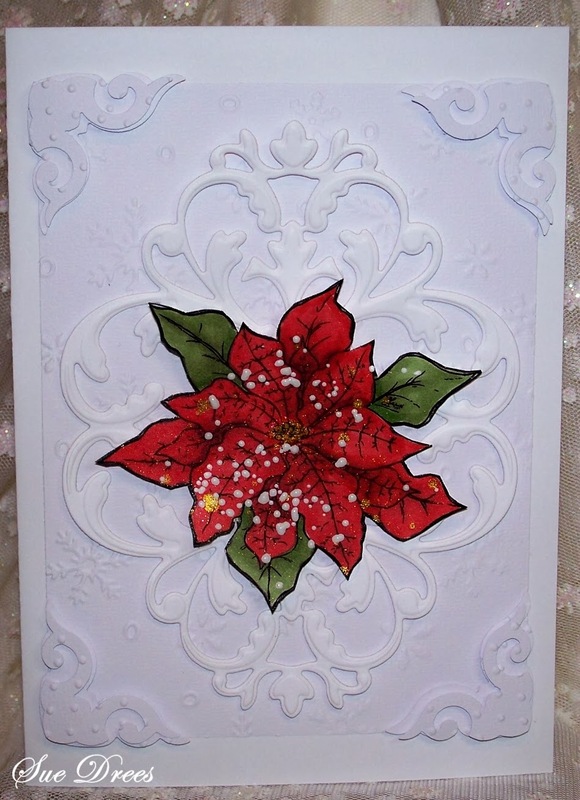 Love the white on white background of your card and the vivid contrast of the red poinsettia. Beautiful card!